Perhaps the most important investment you make in your business is your oven. Baking, after all, is the final testament to your art. All of the hard work and preparation you put into your product culminates in the baking process. 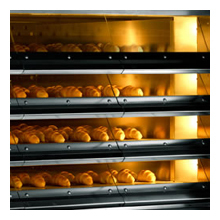 A good, high quality bakery oven will provide you with consistency and reliability for years to come. Choosing the proper oven for your needs depends on a variety of factors. The type of products you make, the volume you wish to produce, the space you have available and even your budget all effect your choices. If you're looking to bake high quality Artisan breads like ciabatta, baguettes, rustica breads, rolls and more, than chances are a Stone Hearth Deck Oven is right for you. Like traditional brick ovens they bake so well because of their ability to retain heat. Breads and rolls are baked directly on the stone hearth providing that unmistakable bottom finish. Steam systems allow you to control exactly how much steam you supply each deck allowing you to achieve the perfect crust. Let's take a look at some of the additional advantages of owning a Deck Oven. Highly efficient Stone Hearth Deck Ovens can boast a fuel consumption savings of 60% to 75% over some other traditional bakery ovens. This is accomplished, in part, by a firebox made entirely out of oven brick and by encasing the Vapor Tube heat distribution system in poured cement. This gives the oven the ability to retain tremendous amounts of heat so that even when the burner shuts down the oven can continue to provide an even baking temperature. This residual heat allows the burner to fire less often resulting in a significant fuel savings. 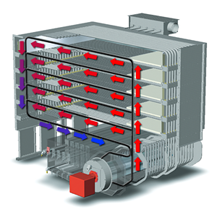 The exhaust systems of some modern Stone Hearth Deck Ovens utilize 3-phase electric allowing them to use far more efficient exhaust systems than their single phase counterparts. In addition, the lack of rotating trays and other moving parts means one less motor to power altogether, which translates to a significant electrical savings. Water consumption is also an area of Deck Oven efficiency. A quality Stone Hearth Deck Ovens that utilize a self-contained steam system is able to maintain a 99% steam retention rate - far greater than that of an oven utilizing a traditional remote boiler system. These remote systems tend to purge condensed steam frequently consuming both more water and fuel - a highly inefficient process. Vapor Tube Technology may be of particular interest to the energy conscious baker. In a Vapor Tube Deck Oven, a single indirect burner heats the sealed vapor tubes turning the contained water into steam. The steam then circulates through the tubes by natural thermodynamics, radiating its heat evenly before condensing back into water and circulating back to the heating camber. These Vapor Tubes deliver heat evenly throughout the baking zone with no fans or moving parts necessary to distribute the heat. This provides consistent quality from front-to-back, side-to-side and deck-to-deck with no damper or airflow adjustments. For some businesses, the price tag on a brand new Deck Oven can be intimidating. The key to success, however, is considering long-term sustainability over short-term impact. What will you return on investment be 1, 5 and 10 years from now? How will those energy savings help you both now and into the future? Crunch those numbers and compare your financing options to your expected energy savings. You may find that you can actually save more in energy costs than the lease payment itself, allowing you to return money to your bottom line! 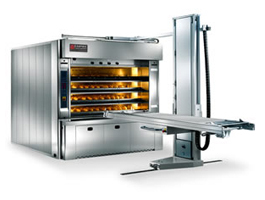 As you can see, Stone Hearth Deck Ovens provide many advantages to your bakery production. Efficiency is going to be your key to profitability, and since there are very few moving parts Deck Ovens usually require less maintenance than other oven systems. Available in wide range of sizes, Artisan bakers looking for old-world style results will find the Stone Hearth Deck Oven hard to beat. If you need assistance selecting the Deck Oven that's right for you then speak with a qualified bakery equipment representative today. 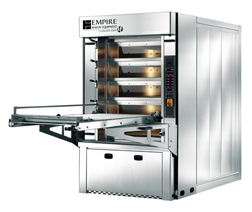 An equipment company like Empire Bakery Equipment with extensive knowledge and experience can help you make an informed decision will not only help you invest in your baking equipment wisely, but will also help support you for years to come.